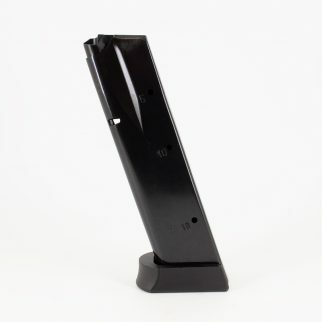 Extended magazine release for the P-07/09. Adds .100″ to the activation side of the mag release. Drops in with no fitting and fits perfectly. Precision Made in the USA. Black oxide finish and heat treated for outstanding durability. No springs or pins included. USPSA Production Approved. TECH TIP: This part is very easy to install. Push the internal plunger in the OEM mag release to the left and simultaneously lift the center mag retaining pin in the frame. Re-install the OEM mag plunger and spring in the new CGW mag release. USPSA Production Approved.